"It's going to be really good for my brand next year. And it's also going to be good for the Prodigy brand." 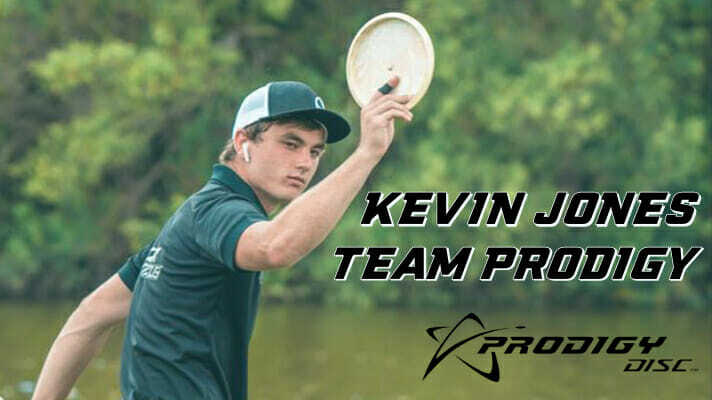 After two years with Prodiscus USA, Kevin Jones has taken the next step in his budding career by signing a 3-year contract with Prodigy Disc. Jones had long been expected to leave Prodiscus at the end of the 2018 season, and given his strong play, particularly later in the season with a top 10 finish at the PDGA Professional World Championship and a podium finish at the USDGC, was widely courted by manufacturers. “What we want to do as disc golfers is to play as a career, so I was looking for the best career opportunity for me,” he said. Jones fielded offers from most of the major disc companies but eventually settled on a deal with Prodigy, which he said felt was the best fit for him as he considered long-term outlooks. “I think that it was sometime this year that I realized I wanted to do this as a career for the next 20, 30 years, if possible,” Jones said, noting that he really gained confidence over the course of his first year on tour. He said the third place finish at Beaver State Fling made him realize that he could truly compete with the top players in the sport. “Our need was a top-tier, traveling pro, who will be on the road, playing all the larger events,” said Prodigy Disc President Michael Sullivan. “This player would need to be respected in the community, preferably young, with an upside. And ideally, top 10 in the world. Kevin Jones was the free agent that we coveted the most. He is young, strong, and he is a winner. Like most pros that switch manufacturing partners, Jones will have some learning to do. “I putted with the PA-3 a couple of years ago, but, honestly, a lot of [the plastic] is brand new to me,” he said. As part of his Prodigy contract, Jones said he will get outfitted with a vehicle and camper to keep him traveling, and at no cost to him. He opted not to get into monetary compensation of the contract. After the announcement that Paul Ulibarri will not be returning to Prodigy next year, Jones will be one of Prodigy’s top-rated players. Matt Orum (1041), Chris Dickerson (1039), Seppo Paju (1036), Cale Leiviska (1032), and Cam Colglazier (1031) all have the edge over Jones, but he has shown exceptional promise: Jones’ rating jumped from 1008 to start the year to 1030 as of the late November update. “We have a young, dynamic team that is on board for the long haul,” said Sullivan. Jones is already registered for the first stop of the 2019 tour, the PDGA National Tour’s Las Vegas Challenge, set for February 21-24, 2019. Charlie Eisenhood is the publisher of Ultiworld Disc Golf. Comments on "Kevin Jones Joins Prodigy"